Learning to effectively close the distance between you and your prey is what differentiates shotgun hunting from all other disciplines. 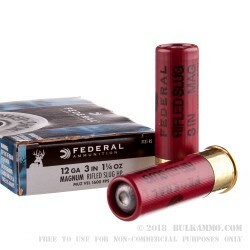 The Federal 12 gauge 1 ¼ ounce Rifled Slug is the key to ensuring a successful hunt, and will put you in range to take down even the largest of game within the continental United States. The rifled contours along the slugs outside diameter ensure stability and accuracy after the slug departs the barrel. 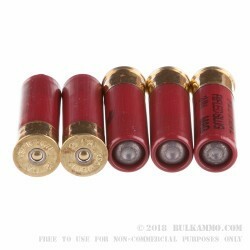 Unlike traditional foster slugs that are unable to achieve a proper rotation due to smooth bore of most shotguns, the Federal 12ga 1 ¼ ounce rifled slug can be accurately fired from any smooth bore shotgun, and is one of the most versatile rounds in its class. At a muzzle velocity of 1,600 feet per second, the 1 ¼ ounce solid lead slug is capable of delivering an astonishing 3,109 foot lbs of force on target, and delivers a level of hydrostatic shock unmatched by even the most lethal of large bore caliber rifles. 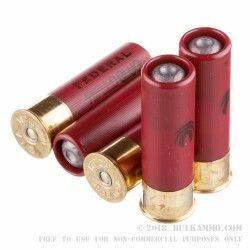 Shotgun hunters who are looking to take their hunt, and their power to the next level will find no better solution than the the Federal 12ga 1 ¼ ounce rifled slug.